This is what happens when you ignore the opticians reminder to make a review appointment and you swipe a bottle of vanilla extract from the shelf in the supermarket. You rummage around in the cupboard looking for it and voila it has magically turned into almond extract. Great mistake. The almond extract gives this mousse such an unbelievable kick that it is paradoxically intense and light at the same time. 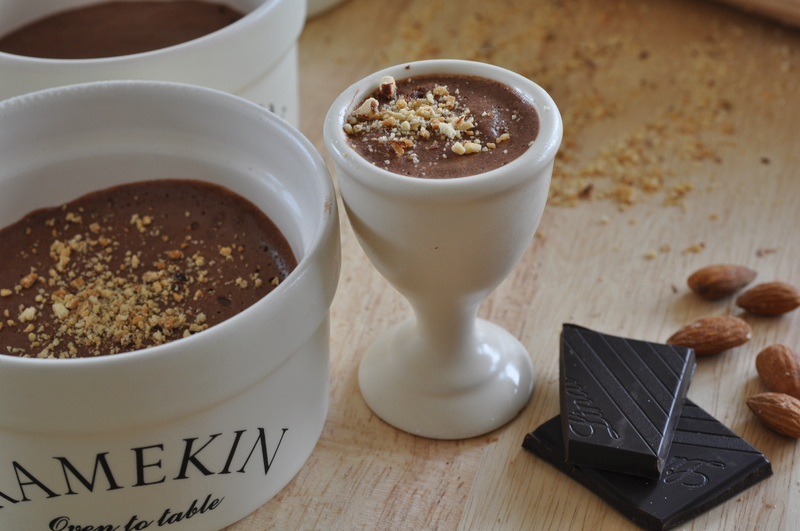 So much so that while I made some tester pots in egg cups and the rest in ramekin dishes I would recommend making this mousse in really small ramekin dishes or indeed good looking egg cups. This chocolate mousse is made with just the egg whites and with greek yoghurt thinning out the chocolate. This is most definitely NOT a child friendly dessert so reserve this one for dinner parties. 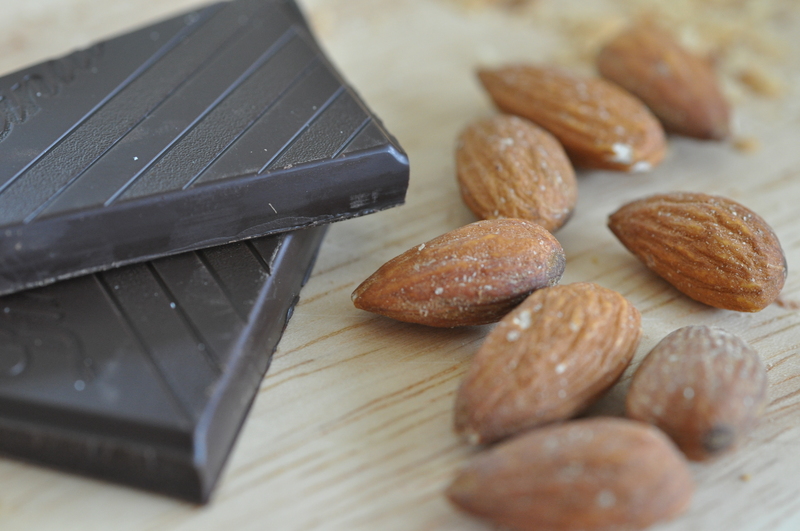 Heat the oven to 200 and put the almonds in to roast for 10 minutes. Be careful not to burn them. The mousse does not get cooked so turn off the oven afterwards! Boil a saucepan of water, reduce the heat to a simmer and get a bowl ready that will fit over the saucepan. Mix the coffee, almond extract and 2tbsp cold water. Finely chop the chocolate and place in the bowl with the coffee mix. Stir well and remove the saucepan from the heat. Stir occasionally until all melted together. Stir in 2 tbsp of boiling water to thin out the chocolate. Whisk the egg whites to soft peaks, then whisk in the sugar until thick. Stir the yoghurt into the cooling chocolate. Carefully fold in the egg whites using a metal spoon taking care not to over mix. Spoon into small remekins or egg cups and chill for a couple of hours or overnight. Bash the roasted almonds with a rolling pin and sprinkle on top. Also good with raspberries and a dusting of cocoa. This looks so delicious! I’ve always loved chocolate mousse, but I’ve never tried it with coffee and almond. Sounds great!